A standing seam metal roof can add superior protection any home or commercial building. Middle Creek Roofing is experienced in installing both standing seam and corrugated metal roofs. Standing seam is the most popular style of metal roofing for residential roof replacement and re-roofing applications. Metal panel roofing can last as much as three times longer than asphalt, while offering superior energy efficiency, durability and reliability. Contact us today to schedule an in-home consultation and get a free estimate on standing seam or corrugated metal roofing installation in Allentown and Greater Montgomery County, Chester County & Nearby. 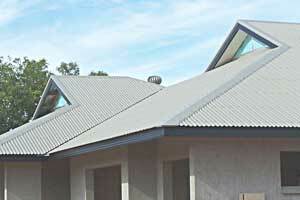 The most familiar style of metal roofing is standing seam roofing. This panel-style metal roofing is installed in vertical sheets and has raised ribs. 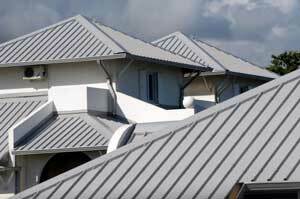 Standing seam metal roofing is commonly used on commercial and industrial buildings, but has become more popular for residential roofing. Middle Creek Roofing installs quality standing seam metal roofing panels that are durable and a great choice for residential, commercial and agricultural building applications. While mostly used on barns and industrial buildings, corrugated metal roofing has become a popular option for homes. Corrugated metal roofing has been widely used on agricultural, commercial and industrial. You might picture an old barn or farmhouse covered with wavy steel panels with rust spots and peeling paint. Many improvements have been made to corrugated metal roofing systems over the years, making it a practical alternative to asphalt shingle roofing. Although corrugated roof panels are more expensive than conventional roof shingles, corrugated-style metal roofing is typically more affordable than standing seam. There are a wide variety of corrugated roofing systems available for residential re-roofing and roof replacement projects. If you decide to invest in a corrugated metal roof, it's important to keep in mind that corrugated roofing generally requires more maintenance than standing seam roofing. The metal roofing contractors at Middle Creek Roofing can help you choose the best metal panel roofing system for your home. Contact us today to schedule your in-home consultation and free roof replacement estimate in Allentown, Reading, Bethlehem, or surrounding areas in Pennsylvania.